In case you missed MB Labs’ demo of their project for the Red Bull creation contest last Sunday night, the page describing their build is up and is giving us at Hackaday a run for our money. The Morphield consists of a piece of fabric stretched over a frame, itself hiding 135 solenoid-controlled balloons that move the field instead of playing soccer by moving the ball. These solenoids are controlled by a wiimote, allowing players to manipulate the terrain of the field and hopefully guide a ball into their opponent’s goal. In addition to creating a worthy competitor to Hackaday’s own Minotaur’s Revenge, MB Labs also released an Arduino library and an API so the Morphield can be repurposed for other games, kinetic art installations, and – we’re hoping – a gigantic, soft version of a pin art display. When the guts of MB Labs’ Morphield was revealed on the Red Bull Creation live stream, the only words that showed up in the chat window were ‘wow,’ ‘holy crap,’ and ‘amazing.’ We’ve got to agree; the guys put together a really cool game that will also be over once the Creation contest is over. 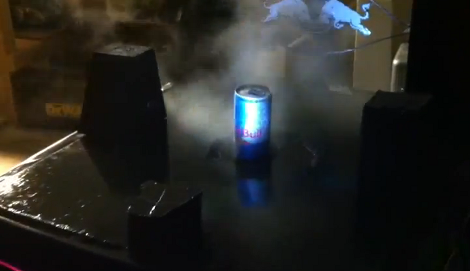 North Street Labs really brought their ‘A’ game to the build finals for the Red Bull Creation contest. Behold the Centrifury, their spinning hell of a game. You can’t really make it out (because of the spinning) but the game consists of two bucket seats positioned opposite of each other on a merry-go-round type deck. 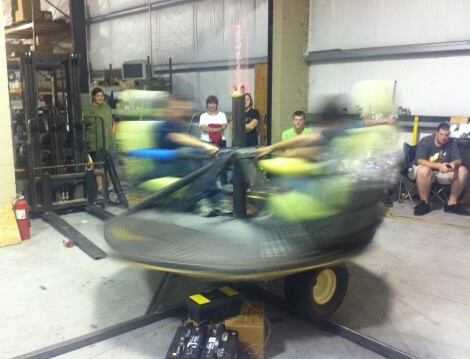 Each player has a button in front of them which must be held down for the rig to start spinning. When you can’t take it any more just release the button and the spinning will stop. But you’ll also have lost the game. Whomever can hold out longer wins. It’s not surprising to see such a well-polished build. After all, this is the same group that built the violently vibrating game of Simon. This time around most of the work came in the form of engineering and welding. First they had to make sure the design could take the forces this things puts out, then they had to build it. And all within the 72-hour time limit. We’re not sure what’s harder, winning the game or trying not to smile while watching the video after the break. For the full writeup on our entry, go here! We built two giant marble mazes. The maze itself is all mechanical, with a 2 person team controlling x and y axis. The fun happens though when you hit buttons to activate magnets and traps on the other team’s table. Check out the Live Stream. Nothing is happening at the moment, but a couple of dedicated Hackaday fans are checking out an empty couch. We have a very strange readership. [sonofabit] recorded the last 8 hours of the build at 1fps and made a time lapse video. It’s an hour long, and we thank [sonofabit]’s CPU for all its hard work. You can also check out the video after the break.